The geologic account of ancient life is plagued with reports that do not withstand critical assessment. This is a special problem in the older rocks, where reports of spurious records continue to dilute the authentic record of evolution on the primitive Earth . . .
. . . It is left to the reader to draw conclusions about similar instances not here alluded to; the record of alleged pre-Phanerozoic life is full of them. Harsh perhaps, but Preston Cloud's words should be engraved on the cover of every Proterozoic geologist's field notebook. Frankly, the Proterozoic is weird. Most of what you think is organic, isn't. The vast majority of the rest is microbial mats. And the stuff you really, really think could be metazoan, is usually microbial mats playing silly buggers. I don't want to become a party pooper (and no that's not a plug for Bora's pootopia). I don't, I really don't. I want to be able to yell and scream about some new find that pushes our knowledge of the early evolution of metazoans back well into the Proterozoic. I do, I really do. In Nature Geoscience, Maloof et. al discuss possible sponge-grade metazoans from the approx. 640 million year old Trezona Formation in the Flinders Ranges of South Australia. The authors then describe 3D shapes using serial sectioning (grid a bit off, photograph, grind a bit off, photograph). These 3D images show a three-dimensional network of 1mm diameter interconnected tubes. The tubes are also lined with micrite. 2) The red colour and micrite composition is unique to the deposits - no source of the chips can be found. 3) The micrite coating in the tubes and around the clasts may represent weakly calcified cell layers. OK, lets split these up. The first two deal with the lithology and composition of the clasts. The authors say that the clast shapes produced cannot be formed from mud chips or bits of stromatolite, and that is true. It is also true that there are no lithologies similar in colour or composition to the clasts anywhere else in the Trezona Formation. This means that the shapes cannot represent chips eroded off earlier formed mudstones because there are nor similar lithologies or rock types in the area, and even if there were, rock chips cannot create the shapes seen. But there are problems with using that as supporting evidence for a biological origin. There are other explanations. Other abiogenic explanations. The local explanation for the clasts is that they are mud flakes not mud chips, that is, not mud chips eroded off pre-existing rocks, but mud flakes formed when muds are deposited in ephemeral or short-lived deposits, such as ponds after flooding surrounding areas, or overbank deposits. Drying mud Gammon Ranges. Photo Credit. These muds settle and dry out and can form all sorts of shapes. Drying mud, Canyonlands National Park. Photo by Douglas. Drying mud from Death Valley. Photo by Don Gale. Clearly some mud flakes can take on the shapes that mud chips cannot, and can form some of the shapes present in the Trezona Formation that are being used as evidence for a biologic origin. But it gets worse. See the arrowed clasts in the image with the "anvil" shape (at right). These are clearly mud flakes. They show a common curled profile that can be seen in the examples of recent drying muds above. Nor do they contain the tubes that are supposed to be a feature of the "sponge" clasts. Now, here's the interesting bit. Both the obvious mud flakes and the "sponge" clasts are the same colour AND have the same composition (opaque clays and microcrystalline calcite, with the occasional very fine quarts grain - see photo-micrographs above) in other words your typical mud overbank deposit. Especially since the Trezona is pretty much a lowstand deposit (lower sea level). Some of the limestones deposited prior to the Trezona Formation, when sea levels were higher, are now exposed, providing a source for carbonate and putting some distance between the Trezona depositional environment and any non-carbonate source material (meaning that only very fine grained material is likely to reach the depocentre). I think it is clear that the red clasts are mud flakes from overbank deposits, rolled up and redeposited between the stromatolites. In other words, waters carrying red carbonate mud, overtop riverbanks and settle into ponds. The mud settle out and the ponds dry up. The mud then dries, with the carbonate providing a good cement. The mud cracks, curls and eventually are dispersed by winds rain or floods into the nearby sea. The mud could be sourced from further inland on the Gawler Craton, and the carbonate sourced from limestones deposited during the period before the current regressive cycle, of which the Trezona Formation represents a lowstand or low sea level phase. The ephemoral nature of these overbank deposits, and their lack of lateral extent means that they do not contribute to the rock record, but dry out, crack, curl and are dispersed by wind and/or water. This also explains the occasional presence of "silica blebs" within the clasts. These represent very fine sand grains incorporated into the muds as they are deposited. Clearly the mud flakes and "sponge" clasts have the same source - which is not organic. The shapes and colour cannot be used as supporting evidence of an organic origin for the clasts. Now if I'm reading that right, it looks like the authors are suggesting that the original skeleton of the "sponges" has been replaced by the red mud, since there is no evidence for spicules or any other type of a primary skeleton. There are two problems with this explanation for the absence of a primary skeleton. The first is the fact that the red matrix composition is shared with clasts that are clearly mud flakes. The second problem goes to number three in their list of supporting evidence, that the micrite coating in the tubes and around the clasts may represent weakly calcified cell layers. However, texturally similar (but less uniform thickness) micrite also coats peloids that do not seam to be part of the Trezona Fm organisms. Yes, that's a bit of a problem. It's a bit difficult to suggest that the micrite envelopes are evidence of mesohyl when almost everything in the deposit has them. Micrite envelopes are well known and are generally considered to be formed from filamentous organisms (bacterial, algal or fungal) who's filaments calicify and coalesce into a intertwined mesh around the clasts. In this case the areas between stromatolites are colonised by numerous filamentous organisms that grow around all the clasts present and eventually form the micritic envelopes. So having micritic envelopes around the "sponge" clasts and within the tubes cannot be used as evidence of sponge-grade tissues. This means that any replacement of the original skeleton must have occurred prior to the micrite envelope being laid down. However, the tubes must have been sealed during replacement as there is no replacement material in them. After replacement, the tubes must have opened again to allow the micrite envelope to form. The evidence suggests that the red matrix is not a replacement, but a primary feature. Which brings us to number 4, that the interconnected 3D tube structures and the 3D symmetry support a sponge hypothesis. I'll say up front that I do not know what the tubes are. They could be sponge tubes, but the evidence for that is equivocal at best. A more likely explanation is that the "sponge" clasts are mud flakes that have been coated by filamentous organisms, rolled around and glued together. The tubes would then be where the filamentous outer coating of individual clasts, acting as a buffer and holding the clasts apart as a number of clasts were bound together. In the Proterozoic, weirdness rules. This makes interpretation difficult. I don't think the evidence presented in the paper is enough for a sponge interpretation to hold water. However, we've been misinterpreting the Proterozoic for some time, and the authors are in good company. Cloud, P. (1973) Pseudofossils: A Plea for Caution. Geology, v. 1, p. 123-127. Excellent post, Chris. I was quite skeptical of the sponge spicule hypothesis of the researchers, and the dried mudflake genesis of the inclusions is a much better interpretation of the data. As you mention, the "interconnected pore networks" are a puzzle. I'm wondering if they represent macro-scale bioturbation, though this seems quite unlikely given the lack of 'pores' in the smaller inclusions. Perhaps they are simply the impressions of irregularly-shaped dissolved inclusions in the clasts. I'm not sure what to make of the tubes. They could be burrows, but the authors point out that none of them are blind. Maybe some thin sections of the tubes could shed some light. I don't think they are dissolution features - too regular. But you never know! I've walked enough Proterozoic section to know that you never underestimate the capacity of the Proterozoic to throw up something weird. As usual, your analysis makes good sense and your explanation seems more likely. Interesting if sponges were eliminated but bioturbation occurs indicating a higher organism is at work. At least 640 m.y. old sponges only made me go "hmmmm...." as opposed to 2.1 b.y. old metazoans which elicits more of a "WHAT????". Not many more areas of geology more curious than the later Proterozoic! Thanks Your Holiness. The fact that these are probably not sponges doesn't mean there weren't sponges around. 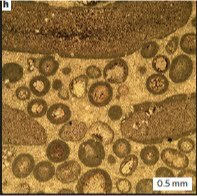 The geochemistry of the Proterozoic appears to have sponge steranes, and there are better (and older) candidates for Proterozoic sponges, but even they are equivocal. Let's not forget a variety of mitochondrial DNA analyses point to a sponge-grade ancestor to almost all metazoans smack-bang in the Proterozoic. I'm wondering if there is a little bit too much conclusion-led research in this paper? You may very well think that, I couldn't possibly comment . . .
Nonsensical find. I'm not saying that mine are any more conclusive, but at least they are recognizable as similar to previous finds. I guess the lesson is that the more difficult to identify, the better chance you have of getting published in nature. Really interesting stuff, Chris. I work on early sponges and will shortly be reviewing the Precambrian ones, so this has really got my attention. Are you going to publish this in a journal sometime? To be fair to Maloof, the interesting bit about Maloof's stuff is indeed those pores. I don't think we're looking at a sponge (i.e. a spicular, complexly organised individual), but I wouldn't rule out something along the lines of a pre-sponge, filter-feeding choanoflagellate biofilm. If it is biofilm, it's quite an organised one if it's got pores in, but I'd half-expect something along those lines to have appeared at some point. Yes, I agree that the pores would appear to show some degree of organisation, but not at the sponge-grade. I also agree that the biochemisry needs more work. However, I also think that sponge-grade was achieved 600+ mya. Malcolm Walter and his team at Macquarie University appear to have better candidates for framework sponges even earlier than the Maloof examples. This is slap bang in the middle of the Cryogenian - so much for a completely snowballed earth theory. I wont be publishing. Nature has a policy of only publishing rebuttals that contain new information (presumably because their refereeing is so good that nothing could get through that could be rebutted with what we already know!). Any rebuttal should probably go in a paper discussing new material anyway. I disagree that there's something weird about the Proterozoic, everything is weird about the Proterozoic!